The bill now heads to the desk of Republican Gov. Nathan Deal. The Georgia State Senate unanimously passed legislation today that would allow for third-party ownership of rooftop solar power in the state. The bill, which passed the Georgia House of Representatives unanimously on February 9, now heads to the desk of Republican Gov. Nathan Deal. Experts tracking the legislation said the governor is expected to sign the bill into law, which could happen as soon as today. National solar installers like SolarCity, SunPower, SunEdison and Vivint are likely to benefit from the legislation, which would allow residential customers to lease rooftop solar installations and sell the excess power they generate. Signaling a major compromise, the state’s largest utility, Southern Company subsidiary Georgia Power, backed the legislation passed today. In exchange for allowing third-party ownership, the bill caps the size of residential solar projects to 10 kilowatts, and limits amount of solar power commercial customers can generate up to 125 percent of their annual peak demand. “We supported the legislation because we believe it allows for solar development in a cost effective way, a way that protects the reliability of the grid and doesn’t burden the non-solar customer," said Georgia Power spokesperson John Kraft, in an interview. “We’ve long said we favor a diverse energy mix with multiple resources,” he added. Georgia Power currently maintains a fleet of nuclear, natural gas, coal and renewable power plants as part of its all-of-the-above energy strategy. “And solar has a role to play in that,” said Kraft. 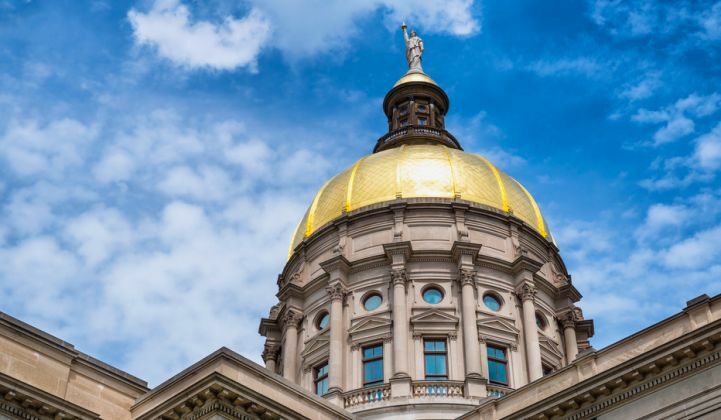 The “Solar Power Free-Market Financing Act of 2015,” spearheaded by Rep. Mike Dudgeon (R), was a year and a half in the making, with a strong push from the conservative grassroots group Georgians for Solar Freedom. With 161 megawatts of installed solar, Georgia currently ranks 15th in the country in installed solar capacity. In 2014, Georgia installed about 45 megawatts of solar electric capacity, most of it at utility scale, due to the generally high upfront costs of buying residential solar. Allowing for third-party ownership “is a great start to getting things going down here in Georgia,” said Kirkland. Georgia passed “bidirectional metering” legislation in 2002 that requires utilities to buy excess power from distributed generation, but allows them to negotiate how much they will pay for it. Net metering in Georgia, at the full retail rate, "is a critical step for establishing a stable market," said Susan Glick, senior manager of public policy at Sunrun and spokesperson for The Alliance for Solar Choice. If Gov. Deal signs the bill before the legislative session ends on April 1, there will be only four states in the U.S. that prohibit third-party ownership of solar installations: Florida, Kentucky, Oklahoma and North Carolina. However, solar advocates in Florida and North Carolina are actively looking to change that.